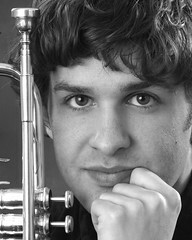 Spencer Aston teaches trumpet and conducts the MYSP Chamber Orchestra at Powers Music School. He currently holds a position as Assistant Professor of Music at Bridgewater State University where he maintains an active trumpet studio and serves as Director of the BSU Bear Band. As a performer, Spencer maintains a busy schedule as a freelance trumpet player and conductor. He is a founding member of the Fenway Quintet, a professional brass quintet based in Boston and holds positions in the trumpet sections of the Atlantic Symphony Orchestra, New England Symphony Orchestra and Glens Falls Symphony. As a conductor, Spencer serves as Music Director for the Windham Concert Band in Windham, NH and during the summer is the Assistant Conductor of the Mercury Orchestra. He holds a Doctor of Musical Arts degree from Boston University, a Masters of Music degree from the University of New Mexico and a Bachelor of Music degree from the University of Cincinnati College-Conservatory of Music. Outside of his musical pursuits, Spencer is an active runner and USATF level 1 certified running coach. He enjoys helping others to achieve their goals and finds the discipline and dedication required to master a musical instrument very similar to those necessary in training for a running event.